When the first music video came out in 1894 it consisted of simple still images projected on a screen during a live musical performance, but it wasn’t until the 1980s that MTV decided to turn the short films that combine song and imagery into a mega production, broadcasting music videos on a 24-hour-a-day basis. Artists, such as Duran Duran, Madonna, David Bowie and Bruce Springsteen, all utilized the craze of music videos as a way to promote their new albums. Michael Jackson, whose song “Thriller” produced the most successful and iconic music video of all time, dominated the music video world by creating addictive videos for songs such as, “Billie Jean” and “Beat It”. Although music videos have seen a decline in airtime with the “reality television” era on the rise, new upcoming producers are creating some of the most adventurous, psychedelic and downright awesome music videos to ever hit the music scene. In an effort to promote the music video comeback, Cucalorus will host “Camp Cucalorus” for a second year, offering teens the chance to immerse themselves in the world of music. 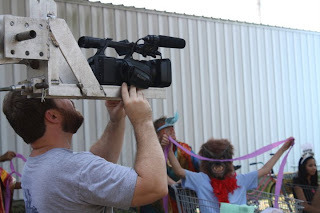 Camp Cucalorus is a weeklong immersion into the world of music videos for budding filmmakers ages 10-18. Packed with behind the camera training, this summer camp will explore the creative world of music video production and editing. With industry professionals at the helm, students will spend one week working in small groups creating music videos for a local band. Hands-on instruction from award-winning filmmakers will be paired with demonstrations from local industry veterans. Each student will have an opportunity to work with a variety of cameras, take a turn in front of the camera and learn professional editing software. The band will be performing live at Jengo’s Playhouse, allowing youth to experiment with concert style filming and meet the members of the band. In addition to an immersion in the creative experience, students will get to see their artistic accomplishments in action at the super-special Premier Screening at Jengo’s Playhouse. Registration is now open for this summer’s edition of “Camp Cucalorus.” Camp Cucalorus will run 9 a.m. - 3 p.m, July 23-26, 2012. Space is limited so apply today! Camp enrollment is $395 and includes: Lunch and snacks for all 4 days, a DVD copy of the finished music video, behind the scenes field trip and 4 tickets to the Premier Screening at Jengo's Playhouse at 7 p.m. on July 26.